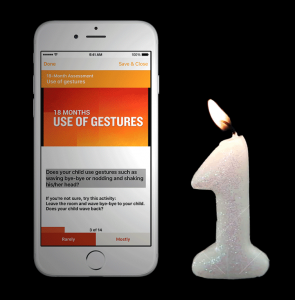 Since its release in February 2016, ASDetect has been downloaded close to 14,000 times across 26 countries, with 7,000 children registered, and 5,000 assessments conducted. Two surveys of users (n = 208) indicated that 60% of parents whose children returned a ‘high-likelihood’ result arranged a follow-up appointment with their doctor, highlighting its immediate impact on families. ASDetect has also raised awareness about early social-communication milestones, educating thousands of people in the community. User surveys revealed that 97% of caregivers reported ASDetect’s videos were helpful in illustrating the behaviours, 90% knew more about social-communication milestones following its use, and 96% would recommend ASDetect to other parents. In May, ASDetect won the Victorian state iAward and in September it won the National iAward in its category for Research and Development Project of the Year. In October, ASDetect went international when Dr Josephine Barbaro and Professor Cheryl Dissanayake were invited keynote speakers at Salesforce’s Dreamforce event in California, which is the world’s largest IT convention, attended by more than 70,000 people. ASDetect was also one of 10 finalists in the Google Impact Challenge Australia receiving $250,000 to translate ASDetect into different languages, including Mandarin and Japanese, expanding its reach to an additional 81 million children globally. We’re now working on evaluating ASDetect, and developing a version for healthcare professionals (ASDetectPRO), further enabling the timely identification and diagnosis of children with autism.